Qualcomm announced a reference design for a 360 camera that can capture 4K 60fps or 5.7K 30fps, with in-camera stitching, thanks to Qualcomm’s new QCS605 chip. Qualcomm worked with original design manufacturer Altek to create a reference design for a 360 camera — designated Qualcomm VR360 — based on the QCS605 chip. 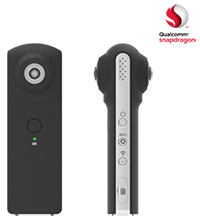 The design looks like a clone of the Ricoh Theta but what makes it unique is the claimed capability to capture 4K at 60fps or 5.7K at 30fps with the possibility of in-camera stitching. If the VR360 is truly capable of these resolutions, it would be the first consumer 360 camera to do so with in-camera stitching. At the time of this writing, there are currently only two consumer 360 cameras with 5.7K 30fps capture capability: the Garmin Virb 360 and Yi 360 VR. Neither one can capture 4K at 60fps. The only consumer 360 cameras I know that can capture 360 video at 4K 60fps at the moment are Vuze and Vuze+. None of the aforementioned cameras have in-camera stitching at their maximum resolutions. It will be exciting to see new 360 cameras based on this new chip. Hopefully it is paired with good optics and competent software, at a reasonable price. Thank you very much to u/Balance- at Reddit for bringing this to my attention. Here is the Qualcomm announcement.